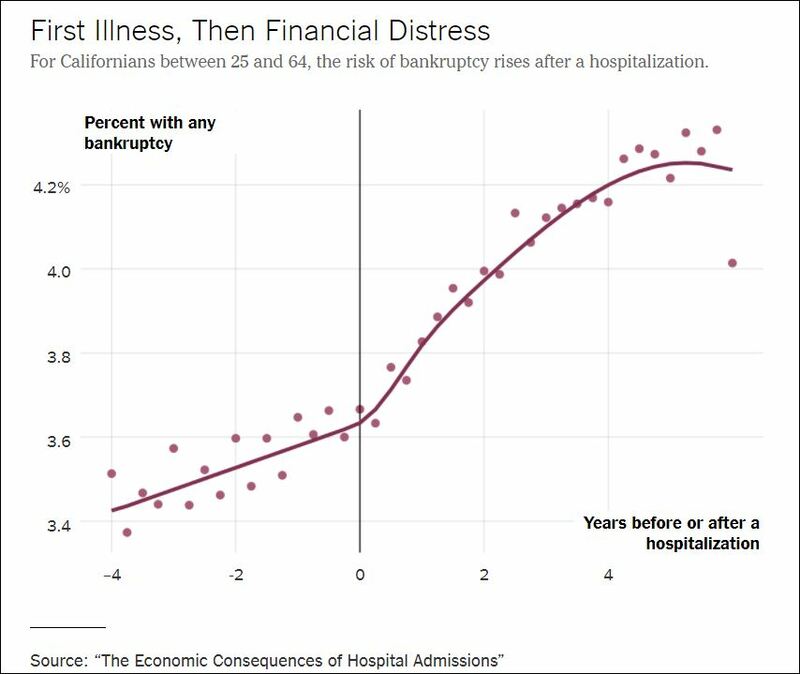 On average, people in their 50s who are admitted to the hospital will experience a 20 percent drop in income that persists for years. Over all, income losses dwarfed the direct costs of medical care. The pattern and impact are comparable to what happens to workers at a mill when it closes. The [researchers] were surprised by how often an illness or injury could upend the finances of Americans with health insurance. 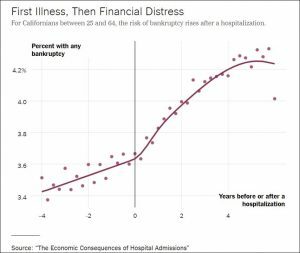 On average, uninsured people in the study owed the hospital $6,000, compared with only $300 for those with insurance. But the average decline in income for both groups was much larger — an average earnings hit of $11,000 by the third year. Much of that average — around 60 percent — came from people who never returned to work at all. The Trump Administration and Republicans in Congress, meantime, keep attacking the ACA, Medicaid, and Medicare, insisting that government should stay out of health care, without explaining how Americans, if they don’t share the risks and rewards of staying healthy — such as through a social safety net and affordable health insurance — can deal with illness and accidents that lead to substantial medical costs and reductions in or loss of employment. Indeed, in my practice, I see not only the huge harms that patients suffer while seeking medical services, but also their struggles to access and afford safe and quality medical care. Depending on their illness or injury, harmed patients may need it for long periods, some for the rest of their lives — and despite what ill-informed critics may contend, juries recognize the huge costs involved in many of their awards in lawsuits. It’s tragic that women shoulder the load in caring for those with dementia, with two-thirds of the caregivers for those with this disease being women, and a third of them daughters. They’re providing more than 20 hours a week on average in hard, unpaid labor to assist loved ones with dementia and Alzheimer’s — patients who, in later cognitive decline, may talk incessantly, wander, be difficult to control, and need basic assistance, including with bathing, dental care, feeding, and going to the bathroom. Although some employers may try to help caregivers and employees with chronic conditions cope with complicated and fraught lives, a Stanford Business School professor argues in a new book, “Dying for a Paycheck,” that U.S. working conditions themselves may be a cause of major harms to Americans’ health. Jeffrey Pfeffer, starting in 2015, argued in a published paper, the Washington Post reported, that “more than 120,000 deaths a year and roughly 5 to 8 percent of annual health care costs may be attributable to how U.S. companies manage their workforces.” He contends too many U.S. companies foster tense, demanding, stressful workplaces where layoffs, job insecurity, toxic cultures, and long hours add to corporate and top executives’ profits but damage employees and their health, as well as adding to national health care costs. He has estimated that negative work-related conditions can be blamed for $190 billion annually in “incremental health care costs,” and their 120,000 deaths per year would make the workplace “the fifth leading cause of death in the U.S. — higher than Alzheimer’s, higher than kidney disease,” he told the Washington Post. Pfeffer says corporate leaders, politicians, and policy-makers need to use existing research and methods to build on what he’s found to figure how to make jobs safer and healthier. They should stop kidding themselves, too, that corporate wellness programs address major woes on the job, including work-life-family conflicts and balancing. As we hurtle toward mid-term elections, American voters may need to weigh whether they’ve been well-served by partisans who have cut taxes for giant corporations and the wealthy elite, while slashing at health insurance and social safety net programs for everyone else — the middle class, young, old, poor, and the chronically and mentally ill. This fall might be an opportune moment to send an unmistakable message about where the country’s headed and under whose political leadership.